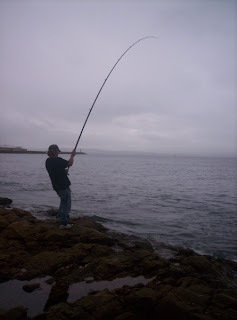 This afternoon after work I decided to slide a bait out at Mosselbay. Arriving there I met two of the locals already fishing. The water color was perfect with the swell not too flat or too dead. While we stood around telling fishing tales and jokes Maruis bait got picked up, He was onto something big. After a few minutes he tried hard to turn the shark but it just went straight out to sea and snapped his line. He decided to call it a day and packed up. Just after he left Andre hooked into something big too. At first we thought he is into a stingray because it did not fight much and was just dead weight. 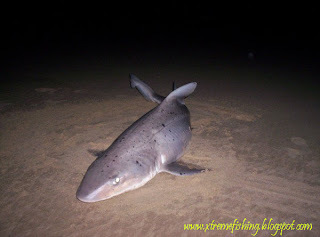 To our surprise we saw it was a very nice ragged tooth shark. I help him to get it out the water onto the rocks,took a pic or two and released her again. That shark just got me very exited. I decided to slide one more bait, seeing I had to take my line out when Andre got his hook up. First I had to fight my slide trace ,with bonito tail on, from the harbor cats. I got it back mostly in one piece. I hooked my slide on and Andre said that he will wait a few minutes before he heads home. We stood there talking while I'm shaking my rod to get my bait out. Suddenly it flt like my bait is getting very heavy. I stopped shaking and felt something pulling steady but slowly on my line. Suddenly the thing pulling my bait sped of and I just lift my rod to set the hooks. The fight started fast. Shark taking line, me winning some back. 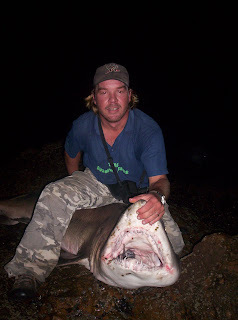 After a back breaking 45 minutes I landed this pregnant female ragged tooth shark. It was quite a mission to land this lady because my head lamp's battery died and Andre does not see well in the dark at all. To top it off I had the wrong shoes on for rocks and I forgot my fight buckle at home. Thank you Andre for putting yours on me. Full length is approximately 2.4 meters. I'm still searching to find a more accurate estimate for the weight. I think it will be heavier cause that was a very fat pregnant female. Anyways, I need to go rest now. Muscles aching from a great evenings fishing. 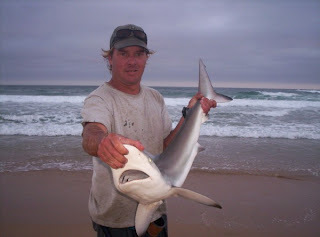 Busy with a small bronze whaler shark. Had loads of fun with these size coming out every cast. 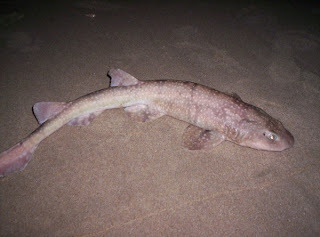 Smooth Hound shark at night. Got a few of them casting out live mullet. 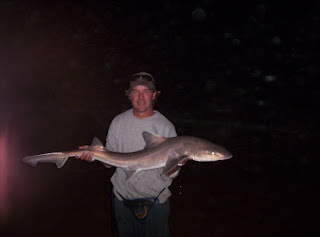 A sandshark I got and swam out as live bait. Got a nice run on it but no hook up. Got it out and the sandy was ripped to pieces. So far I still seem to have some bad luck in getting the BIG ONE. In between everything I did manage to get some time for fishing and landed a few smaller sharks and lots of edible fish(cob,shad and grunter). 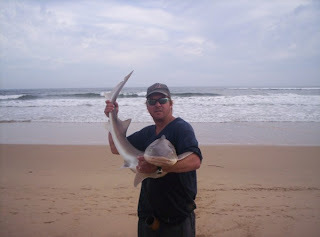 The next day he was busy playing with my reel when this hound shark picked up the bait and ran. Soon he will be catching them with dad. For now I'm waiting for him to start catching the bait fish for the sharks. 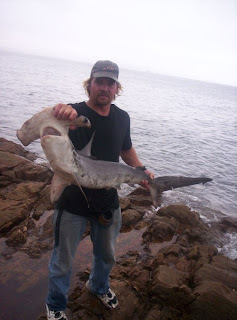 Last Monday I headed down to Mosselbay again to see if the ragged tooth sharks are on the bite already. I was still busy sliding out a whole mackerel when I felt a tug on the line. Suddenly the tug became a strong pull as the slide hit my stop ring and I was on with something. After a few minutes I landed this hammerhead shark. I think it must have fed on squid just before I caught it because after removing the hook everything was covered in black ink. Further I had some nice pick ups while sliding bigger baits but sadly no hook ups. I heard that there are raggies starting to come out on that spot at night so I will be spending a few evenings there. At least work is back to normal and I have more time to spend fishing again. I have been toooo busy!! 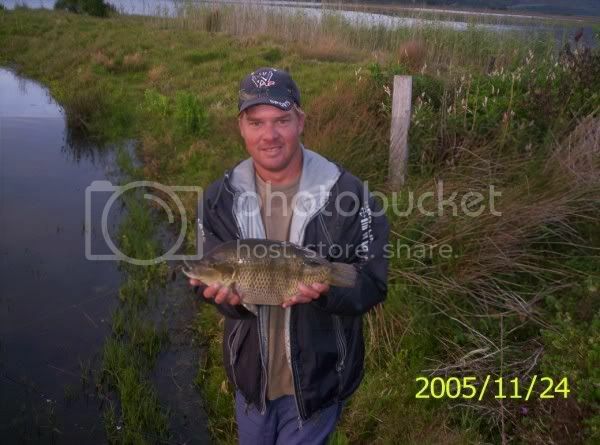 Between loads of work, a growing baby boy, me building a saltwater aquarium and our little town,Great Brak River, getting flooded I did not really have much time for fishing. There was the odd and in between artificial lure angling but not much to write home about. 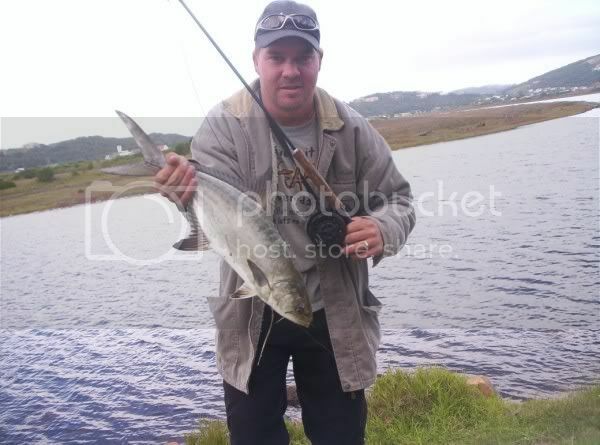 Got this shad on a popper while going for garrick one morning early at Swartvlei lagoon. 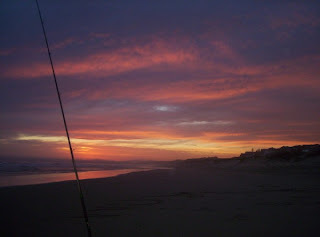 Last Sunday I decided to get my backside on the beach to do some fishing and relax a bit. Everything looked great for fishing. No strong currents, a small beach break and a soft wind to keep me cool. The water still has a little brown color from all the fresh water that came down the river after the flood and the beach is covered in wood. 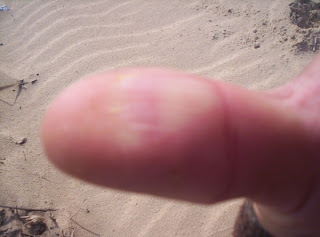 I think from being out of practice my first cast was a nightmare.Trying to stop the overwind from getting out of control a managed to burn the nylon from my reel into my thumb. Needless to say that the rest of the days casting was not very pleasant. After a few minutes I landed a spotted gully shark. Re-bait, re-cast(very carefully) and soon I was on with another fish. 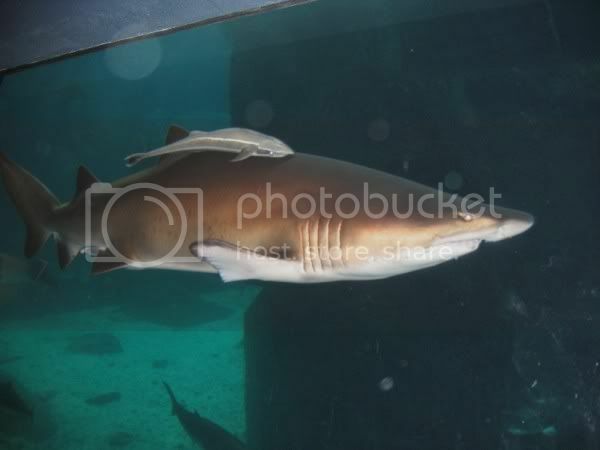 It was a small bronze whaler shark. Cast after cast The small bronzies came out all in the 6 kilogram class. 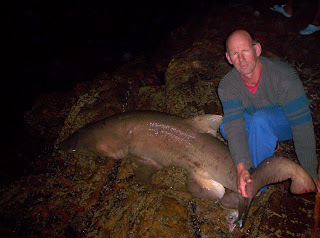 Later after the bronzies started going quite I landed a nice size smooth houndshark. At least I got to spend another day on the beach and got to enjoy another spectacular sunset. Another week or two's hard work and then I can hit the beaches with a mission again. 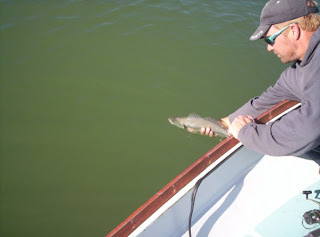 Last weekend Ian and I decided to leave the big fish and have some fun on light tackle in Gouritz River. Early Saturday morning we got his boat ready and headed to Gouritz. We launched the boat just after 6 in the morning. 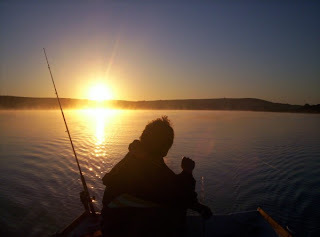 While enjoying the beautiful sunrise we got our tackle ready and started casting and trawling soon after sunrise. After a few minutes I got a nice knock, but lost it. A few cast later I hooked a small cob. We tried for garrick on artlures too but I only managed to hook a very,very small shad. The small cob's very eagerly taking our leadheads. We found most of the fish on the outgoing tide in the zone where the dirty water meets the cleaner colder seawater. All the fish caught were under legal size and returned into the river unharmed. The leadheads we use is about 3/4 onuce in weight and we tie a clouser minnow fly on the hook. Add some blue crystal uv flash and cob will follow. We use 5.5 ft and 6 ft rods with 4kg line. On the lead head we tie about 50 cm stronger nylon and then a swivel attached to the main line. That stops bite off's and also reduces line twist a lot. Enjoy this nice Great white shark footage. The guy swimming with the sharks is Andre Hartman. It must take a lot of guts to climb into the water with animals like that around. He is well known for swimming with sharks in "Shark Alley" at Dryers Island. Proves that Great whites is not MAN EATERS like most people claim, but I would not suggest that you throw all caution to the wind and just jump in the water with sharks. I lost out on a about a month's worth of fishing. I picked up a bad liver infection and started going yellow all over. Tried to fish a few times but did not have any energy. But now I'm ok. Feet in the water, sand in the eyes and smelling like fish. Life cannot be better. 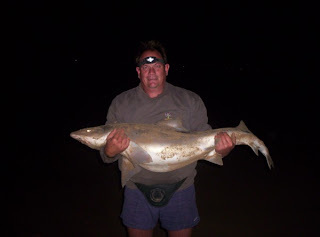 Last night I went down to the beach at Little Brak River to get some fishing done. There I met Frans, one of my friends. He said that there is some small stuff nibbling at the bait but not much happening. I rigged up my sliding gear and slid a nice big whole mullet out. Not too long after that I noticed some movement on my rod tip. After a while I decided to see what is going on with my bait and reeled in, feeling some small fish at the end of the line. 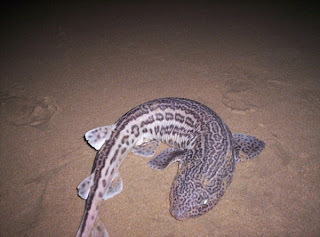 Out came this leopard catshark. Unbelievable that the guy will try to eat something nearly the same size as him. Soon after that I caught this Pufadder Shyshark. Called a shyshark because out of the water it has got the habit of covering it's eyes with it's tail. While I'm busy with this shark I heard Frans's reel screaming a bit and then silence. He got bitten off by a big shark. Suddenly he got a pull on his rod that he use to catch baitfish with. Giving it some time and then he set the hook. This time the fish is on. 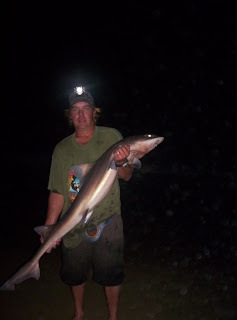 After about a 15 minute fight he landed this nice smooth Houndshark. It was a fat pregnant female. After a few quick pictures the lady was released again. Coming spring (September) I'll try to take extreme fishing to the Extreme. I'm planning to chum for hammerhead sharks behind the surf zone. From a boat of course. As soon as we have enough sharks around the boat I'll get on my paddle ski(not a fishing ski-normal Macski) and see if I can hook and land a decent size hammerhead shark with my fly fishing rod. Ian will man the boat and take some video footage to post on here(and to pick me up super fast if I come of the ski). The above video is the only thing that bugs me. For some unknown reason the Great White Sharks on the South African coastline "breaches" its pry. The stalk it from underneath and with 3-4 strong tail swipes they launch into the air with target in the mouth. Bone crushing experience. 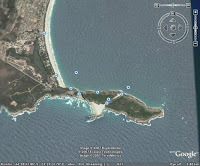 We will be doing this close to seal island, Mosselbay which is well known for Big White's. So I just hope I don't look like seal or turtle from under the water. Ian say that Whites like cheese Crackers. I'm the cheese and paddle ski the cracker. Today I went down to Glentana to see if I could hook into any sharks of the cliffs just pass the old shipwreck. After a hours walk over rocks, ledges and sand I arrived there and felt that the water is icy cold. Not a good sign for sharks. I cut myself some redbait of the rocks and tried to land any small bankfish to use as livebait. Even the bankfish were off the bite today. I managed to catch this one small Wildeperd(Zebra) but released it again. A little later I caught a small blacktail and slid that out into the deep water. After about 2 hours I realised that nothing exiting will be happening so I decided to explore a bit. At low tide the water opened a cave that is normally submerged under the water and I just took a change to run in and take a quick picture before the next set of waves came washing in there again. 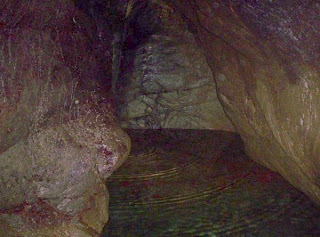 At the deepest part of the cave I found this small pool filled with crystal clear water. It was freshwater slowly dripping through from the mountain on top. Inside there everything just felt so relaxed and calm. 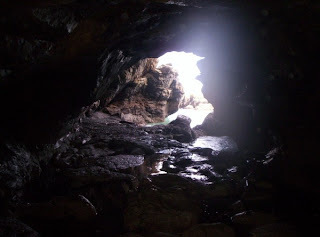 I wish I could have stayed longer but was brought back to earth by the sound of waves rushing into the cave so I had to run over the slippery rocks to get out in time. After exploring for another while I decided to pack up and head home. I cannot wait for the winter to pass so that the fishing can start again. For the next few weeks I'll do some posts on fishing traces and I am attempting to build a 14 ft surf rod so I'll let you know how that goes. But there will still be some odd trips in between. Today I will tell you what happened to me on 4 September 2001. The previous night I did some pub crawling and met up with, Mike a fishing buddy of mine. 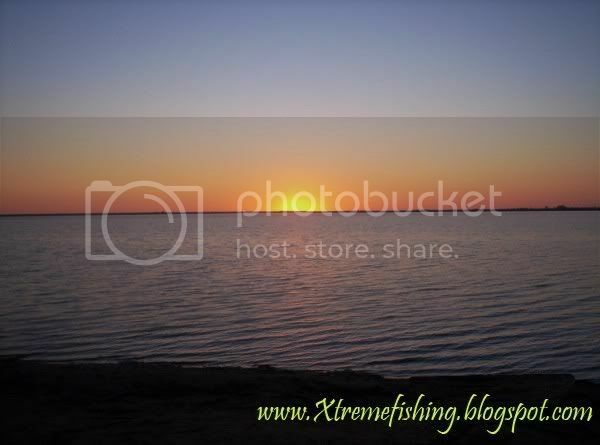 We decided to go fishing the next day on the beach here at Southern cross the next day. It was agreed that I must bring the bait and meet him on the beach. 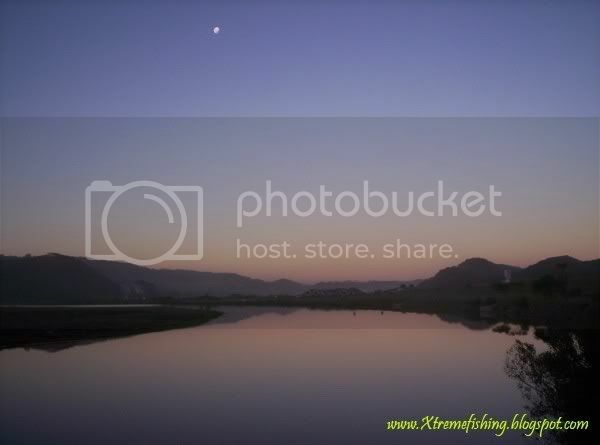 That morning early I went down to the river to pump out some mud prawns. I thought pumping prawns in that cold water with a mean hangover would be the closes I get to any extreme fishing for the day. I got my little bucket of prawns and headed towards the beach only to find out that everyone is catching NOTHING. Next to the hole where everyone is casting I noticed a nice shallow sandbank with the waves working it nicely. I decided to try there for a white steenbra or grunter. So I got my traces and bait on and made a cast towards the bank. Earlier that morning I put new line on my reel. A whole 600 meter roll of 11.3 kilogram line fitted onto my Penn 49A reel. Seeing that I did not tension it enough while putting it on my first cast resulted in a huge overwind. I sat down and undid the crow’s-nest I just created. With my bait lying in about knee deep water I felt something small tug on the end of my line. I did not give it much though as I would probably just be some blaasoppie or baber. I got the overwind sorted out and stood up to to retrieve my line and try to cast again. By this time the hangover felt like its getting babies and multiplying. As I moved my sinker something decided to go the other direction. Fish on. It felt big and after about a 100m run I got it to slow down. I thought it might be a big stingray or sand shark. I start to get back some line and it started to go left. As it hit the next deep channel it headed out to sea again. Mike had to put my fishing buckle on while I was fighting it because it started to look like this might be a long day. By this time you have a whole crowd of onlookers surrounding you and speculating what might be on the other end of my line. Stingray…shark…seal…dolphin….boat. By now it could feel that I’m not fighting anything anymore but just dragging a dead weight through the water. And the floppy 11 foot rod I used is not the best rod for that. And it’s still out far. Suddenly a small boy next to me shouted that he sees something in the water. Now we all waiting for the next swell to see if we can see it too and suddenly there it was. A big long silver body in the swells behind the surf zone. Mike who is always the decent guy made some remarks that I won’t repeat here and he apologised to everyone around us. All I wanted on that moment is to get it out cause every single muscle in my upper body and back was screaming for a break. Getting that dead weight through the waves was a mission on its own. Suddenly the waves will start to roll it out towards the beach and your line goes slack. Then just as fast the backwash takes it back towards the sea and threatens to break your line. By this time Mike and I are almost swimming to get a hold of the fish. 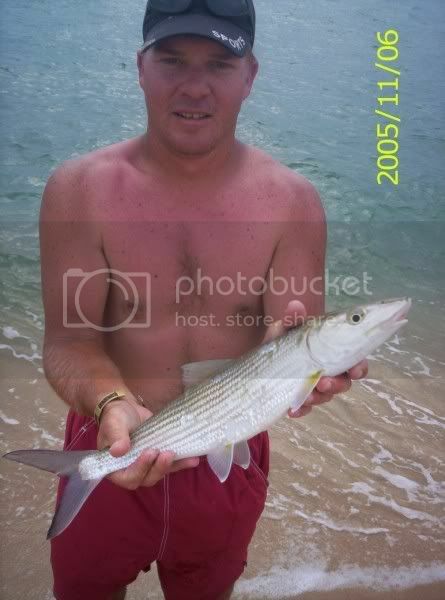 Mike got near enough and grabbed it by the gills and dragged it out onto the sand. A 61.5 kg cob! Everyone looked at it in awe. What a beautiful fish. At first I was unable to think but when the excitement and adrenaline started slowing down I started feeling sad. 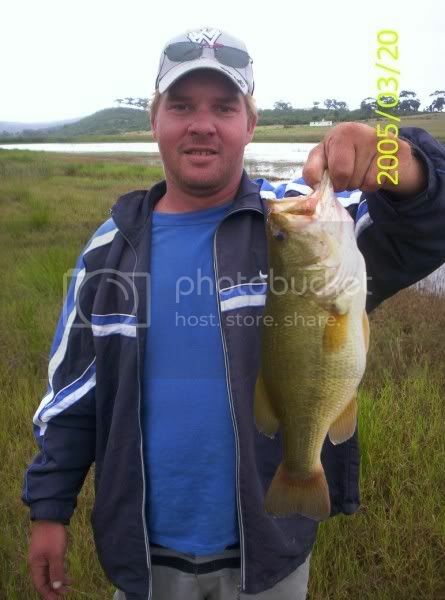 The only thing I would like more than catching a fish like this is releasing it. But that size fish normally drowns during the battle. Full blown winter now. The fishing is not good now. I"M BORED!!! All I can do now is explain it bit more about the tactics and fishing tackle I use. For edibles like cob,spotted grunter, white steenbra’s and shad a nylon line with a diameter of around 0.40mm will be sufficient. That’s for fishing from the beach on sandy areas. Of course for shad you will want to add a small piece of steel cable/piano wire just above the hook to stop them from biting off your hook with their razor like teeth. 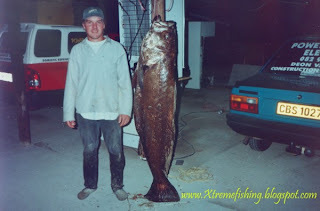 Going for galjoen, white musselcracker or blacktail around rocky areas you will have to use a thicker line that is also more abrasion resistant. Musselcracker is a very strong and dirty fighter so a strong reel will be a good idea. For most sharks around here it will be best to use a line of 0.55mm. And a reel with a big line capacity. 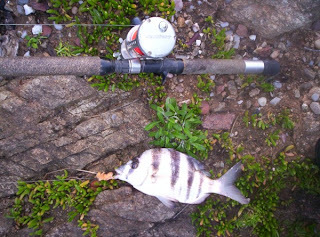 I use a custom build 14ft 400/3 graphite fishing rod with a Daiwa Saltist reel. On the reel I have 300m braided line as backing with about 400m of 0.55mm on top off that. That’s in most cases enough to stop and turn a beast from the shore. To get a big bait (1-5kg) out deep I use a non return sliding clip. I attach a 1mm leader of about 8meters to my main line by means of a bemini twist knot and then a cat’s paw or figure 8 knot. Then you tie on a stop ring with power swivel and a short sinker/lead trace. For sliding you must use a big grapnel sinker to make sure you your sinker stays firmly stuck while you slide your bait out. Next step is to cast out the sinker alone as deep as possible. On rocky areas is normally easier but from the beach/sand you will have to wade/swim out to cast out behind the drop-off. When you are sure your sinker is not going to move you can clip on your slide with two hooks and at least a 150pound breaking strain stainless steel cable. Now you just pull your line tight and rock your rod forwards and backwards. That causes your slide to slide out into the water. Doing that for at least 5 minutes and your slide will be at or very near to the stop ring and sinker. Now use patience till your line goes tight and the fight begins. Remember your fighting buckle otherwise your back won’t be lasting to long. The last two weeks I did not really have time for fishing. Winter is starting to come through at full force and between all the cold fronts I also have a baby busy teething. Generally the fishing here dies down till around September month when the water slowly starts to get a bit warmer. I did fish the Sealine 2Oceans challange on Saturday. 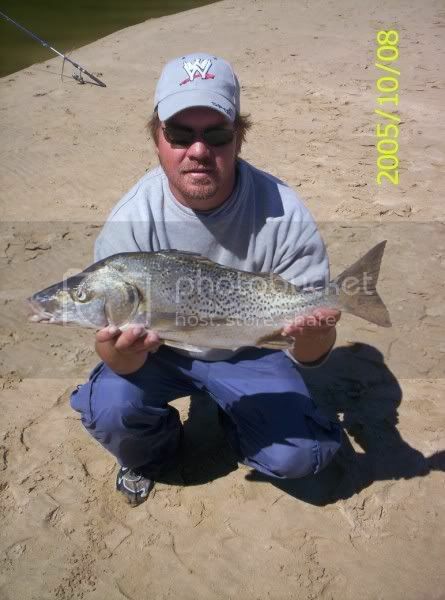 What a disappointment for me to drive 350 kilometers to Betty's Bay near Cape town only to catch one baber. BUT thats fishing for you...Unpredictable!!! On the way back I stopped at Breede River mouth, Witsand to slide for a raggie of the rocks there. More babers and I caught a few small "penhaaie" That's a small shark with strong barbs on its fin. Nasty little fish. The next few days I'll spend my time fly fishing for garricks in the river here and playing some fishing games. Yesterday morning I woke up to a perfect day. 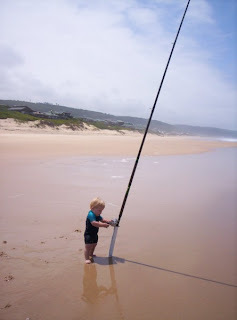 After getting my little one set up I packed my fishing tackle and headed for the beach. I decided to try the waters of Santos beach cause we had a huge swell on the ocean and Santos is sheltered against the swells. Arriving there everything looked very promising for a good day' s fishing. 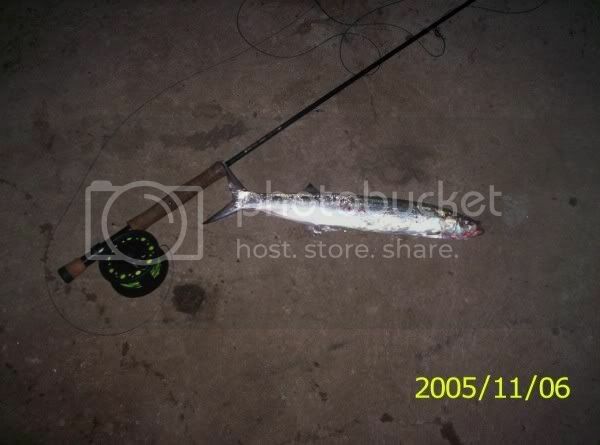 After catching some baitfish and fighting seagulls from stealing my bait again I slid out a whole fish. About 20 minutes later I noticed some movement on my rod tip and saw I going down all of a sudden. 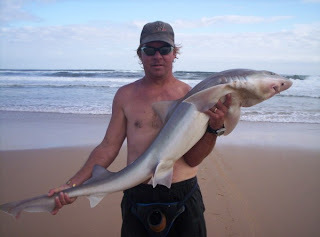 I landed a small hound shark and released it to the amusement of the swimmers/holidaymakers in the water. 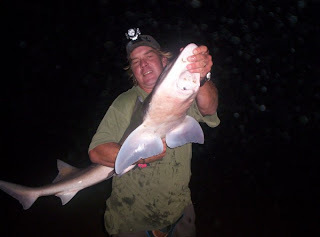 While sliding out my second bait I had to convince them that a hound shark is harmless(especially that size). Another half a hour or so later my bait got picked up and rod got pulled down. 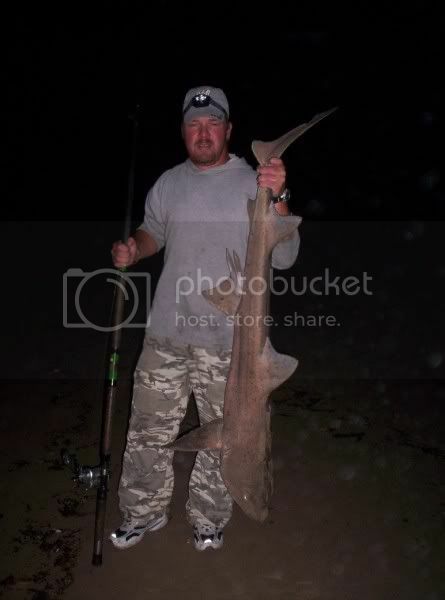 Again a hound shark, just a little bigger this time, still not the size of shark I'm after. But fishing is fishing and I'll be happy with any kind of fish. To me it's all about the sport. 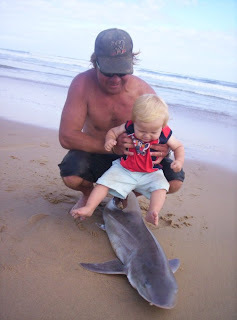 After releasing this shark half of the swimmers decided not too swim anymore and the other half decided that I am public enemy number 1 so I called it a day and went home to spend some time with my baby boy. 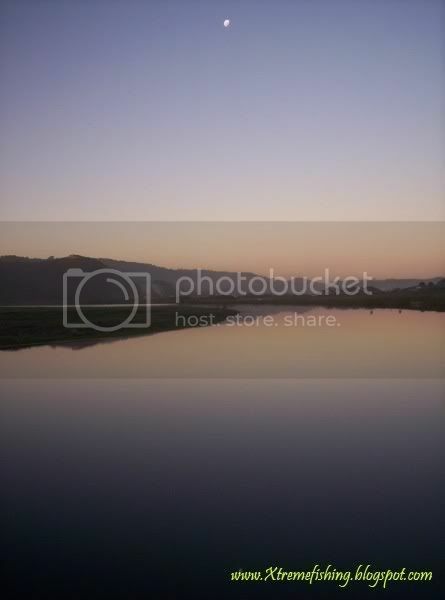 Earlier this evening I went down to Little Brak river to see if i might get lucky there. The water and the sunset looked perfect. But there is a very strong undercurrent around our beaches now so I tried to catch a shad or two but only managed to land a blacktail and some nasty sea barbels. Now while I'm sitting here I hear the wind starting to blow very hard outside so maybe thats the reason the fishing was off tonight. 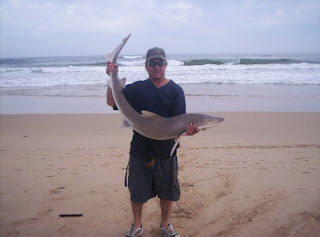 This afternoon I decided to try for a shark at Mosselbay again. 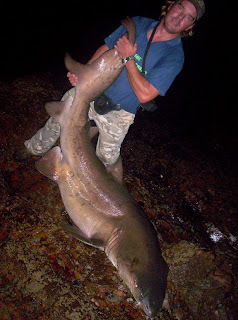 Arriving there I found that one of the guys already landed a baby monster of 2.46m(234kg/515 pound) All of a sudden I started getting fish fever. I baited up and started sliding my bait out into the deep blue unknown. 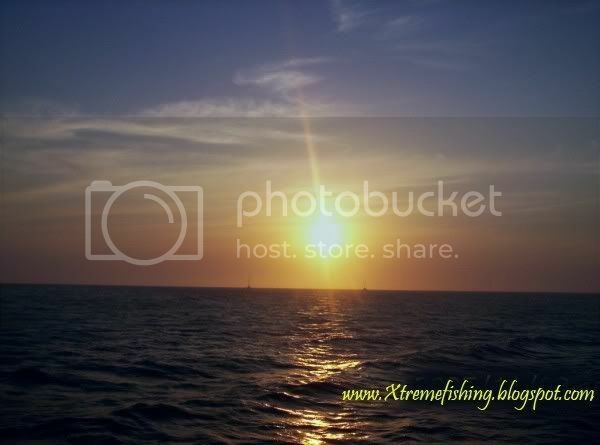 It was a nice and sunny day and the ocean was nice and flat with the water having just the right color for fishing. I nearly had a heart attack from a seal lying on the rocks. 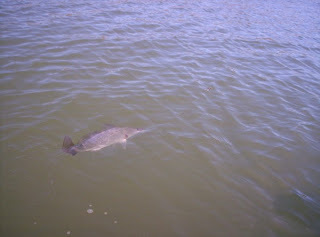 I did not see it and when I went to the waters edge to catch some bait fish the seal "barked" at me. Throughout the day a few guys were caught like that making for some nice laughs all around. After about half a hour or so we saw a big shark circling on the surface and picking up one of the guys bait. But that did not last long as that shark was more or less unstopable. After a quick photo or two the majestic beast was given back it's freedom. What a nice sight to see the king of the oceans swim away into the deep slowly. We all had some pick ups during the day but none landed. Mine took my bait while it was still sliding down and bit of my main line again. Will I ever WIN???? There was a lot of trace and fishing tackle failures all round which made for some very colorful language. Big guys wanting to cry, Giving up hope. But fishing again tomorrow. Fishing is like a drug, you cannot give it up. Sitting in the sun next the sea, breathing fresh air and seeing beautiful animals a drug? Then I'm a real junkie!!! Anyway time for me to get some rest. A long hard fishing day ahead for tomorrow. The past weekend we got hit by a BAD cold front. Icy wind, snow capped mountains and stormy rain kept me off the beach. At least I played some fishing games on my playstation. And I took the time to see if my 4 month old boy might be ready to catch his first big one. I reckon it will still be a while before I can post his first catch on here. I went down to Little Brak river for a short while on Saturday evening to try my luck but only the seagulls got lucky by stealing my bait. 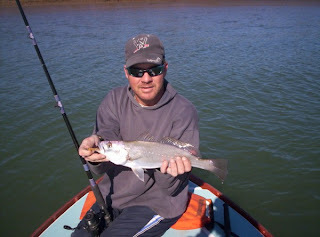 Two holidaymakers there managed to catch some shad/bluefish before the next bit of rain and strong winds arrived. Tuesday the weather started clearing and what a beautiful sight. Everything seems so clean and fresh after a storm. 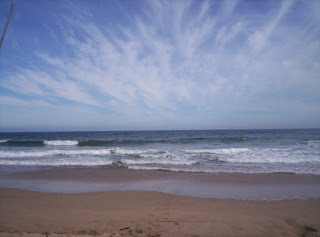 I decided to take a chance in Mosselbay but arriving there the ocean were very rough with 5meter+ swells. After about a hour I did get hooked into a huge stingray but lost it after it nearly ran all my line off my reel. Now all I can do is get my fishing tackle sorted out and wait for the weekend. And dream of the big one that hopefully won't get away. 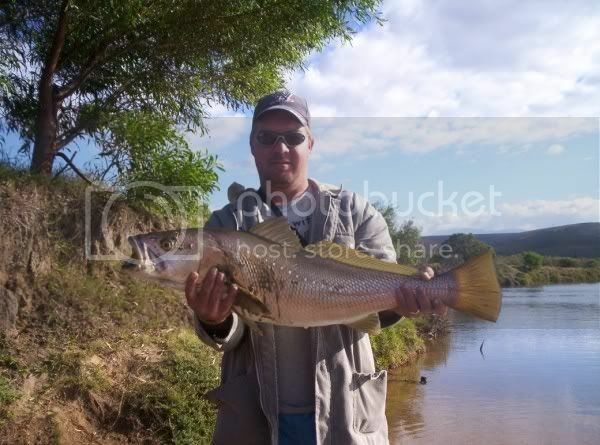 During last week I went fishing at Little Brak river off the beach next to some rocks. The sea was very calm with some heavy weather forecasted for the next day. Just after sunset there was a rush of young shad but died down quickly. 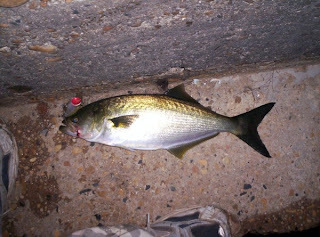 About a hour later when the moon came out the shad started biting slowly, but bigger sizes. I caught my four to use as shark bait and headed home. 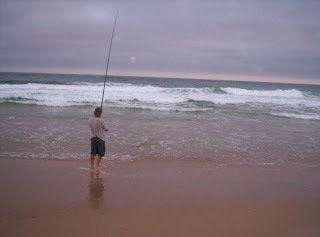 Saturday at Mosselbay the fishing was slow. 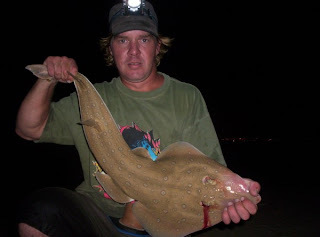 Not much pick ups and just a few hound sharks and a diamond stingray got landed. Sunday was a bit better but it was all adult great whites on the bite. Too big to land. Again we had line and trace failures like mad. 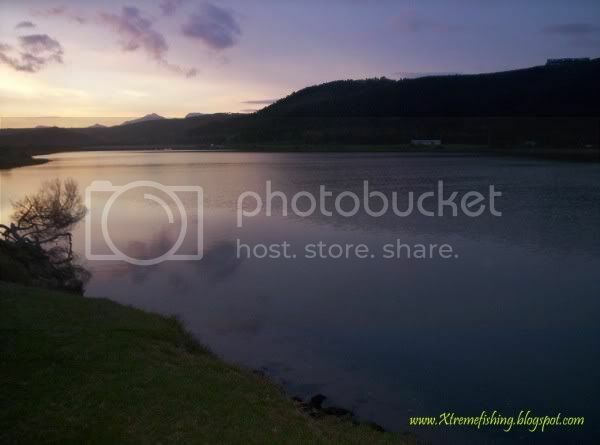 This coming weekend I'll go try at Robbeberg point at PlettenbergBay. It's famous for big sharks and garricks so maybe my luck will turn. It.s just a hell of a walk to get there so I'll have to pack as light as possible. Here you can see what I mean. Sunday morning I decided to have a second go at the big sharks. But like with fishing no day is the same. We had perfect weather but the pick up's were slow. I had a good pick up later in the afternoon but it was to big to stop and it took all the line off my reel. I'm not even sure that shark knew he was hooked. 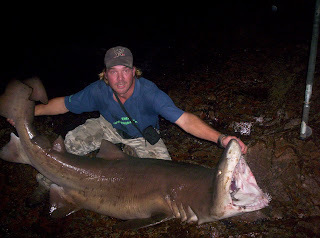 I'm planning a trip there on Wednesday again (with stronger and longer line) and are hoping that I will be able to get a big ragged tooth shark out for a nice photo. And all guys going for big fish, Please don't use stainless steel hooks!!! Rather use something that will rust away fast. The weekend before last was not good for fishing at all. We had gale force winds and rain for the whole weekend. We were brave enough on Saturday morning to brave the elements but just waisted our time. The wind nearly blew us off the rocks at Glentana and we were not even able to catch a live bait to slide. 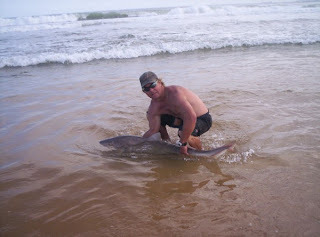 During last week I heard the guys are hooking into nice sharks and stingray's at Mosselbay. I decided to try my luck there this past weekend. I arrived there on a very misty Saturday morning and heard that Freddie hooked and landed a 121kg 197cm great white shark already(new southern cape record)While I greeted the guys two off them got picked up by great whites. Now in a hurry to get ready I quickly caught some Strepies to slide in for the sharks. Not too long after I saw movement at my rod tip and suddenly the fight started. I was into a young great white but it bit of my leader line on the edge just before we could land it. New bait in and about a hour later my reel started making that very familiar smile on your face noise. Shark on again. This time it was a much bigger shark and a few times it had us holding our breath as it nearly ran all the line off my reel. It took me running and falling all over the rocks trying to keep up to it and winning back some line. After a 3 hour fight it did not seem to tire at all. I wish I could say the same for me. And then the worst happened. It pulled my line over a rock full off black mussels and it got cut off. What a disappointment. 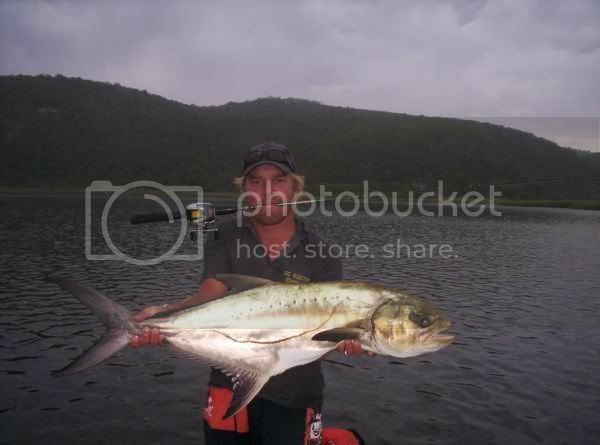 In the time I had that one on Riaan landed another one of 196cm. And a few guys got picked up but got either broken lines, trace failures or bitten off. The bigger sharks seem to like biting through the 440lb carbon coated stainless steel wire. Maybe that is a good thing cause I reckon there is no way in hell to stop that train when it realized its hooked. During Saturday we counted 23 hook ups of which only 2 got landed. We all headed home with broken tackle, stiff bodies and very broken ego's. On Monday evening Robert and I decided to go fish of the rocks at Victoria Bay for some shad for the pan while I slide out a bait for my raggie. Arriving there I met up with another one of my fishing friends, Ian. He was busy spinning with a spoon and the shad was taking it eagerly. 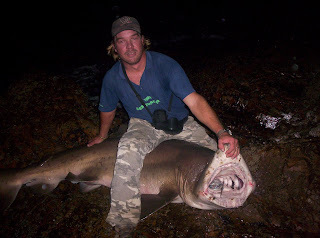 There was lots of bait fish and shad in the water so I thought I might get lucky with a big shark...I WAS WRONG. I slid out a whole shad but nothing picked it up. I have a idea that the other shad ate it off piece by piece with their razor sharp teeth. At least we had great fun with the shad on light tackle. The thing that I found disturbing is all the left over nylon and plastic bags on the rocks left behind by the previous anglers. And the smell of the rotten bait. Come on guys. Plastic is very light. Carry it back home with you or at least to the closes dustbin. And nylon line just being left on the rocks. That's plain stupid. And dangerous. Mono filament fishing net 600 years"
At 9 when we decided to go home we got stopped by a marine inspector. They were very friendly and polite and wanted to check our fishing permits and fish(for size and bag limits) Lucky me received a R300.00 fine for not having my permit on me. For some stupid reason I did not put it back into my fishing bag. So learn from my mistake. Take your permit with you on your trips and if you still don't have one GO BUY ONE. 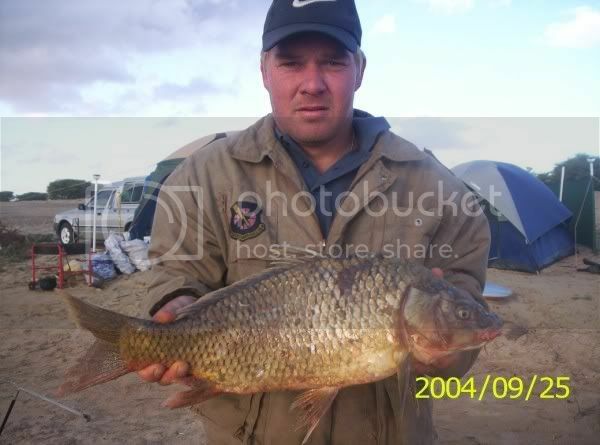 It's only R65.oo for a full year(available at any post office) Instead of a R300.00 fine you can pay your permit for 4 years and still have change for hooks and bait. And don't be rude to the inspectors. They are only doing their jobs. If they don't protect the ocean resources we won't have anything left to catch. And I won't start to play golf now. Iberpesca - LIVE and Preserved FISHING BAIT - Import, export, Wholesale . WELCOME TO DARBLEYFISH, IRELANDS PREMIER FLY-TYING TOOLS & MATERIALS WEBSITE, HAND TIED IRISH FLIES.